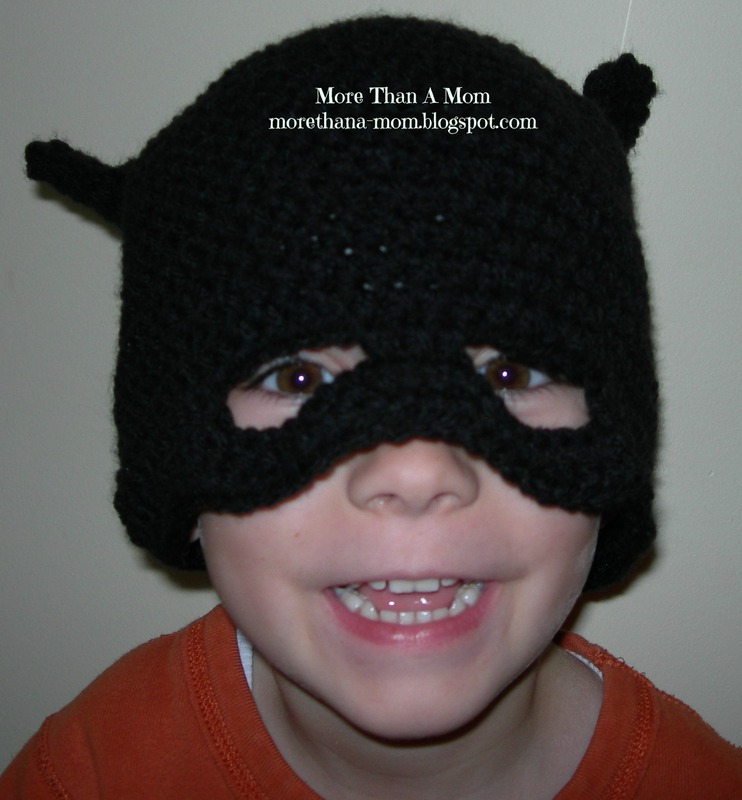 More Than A Mom: Crochet Batman Hat - FREE Pattern! Crochet Batman Hat - FREE Pattern! My little man (4 years old) is all about superheroes this year. 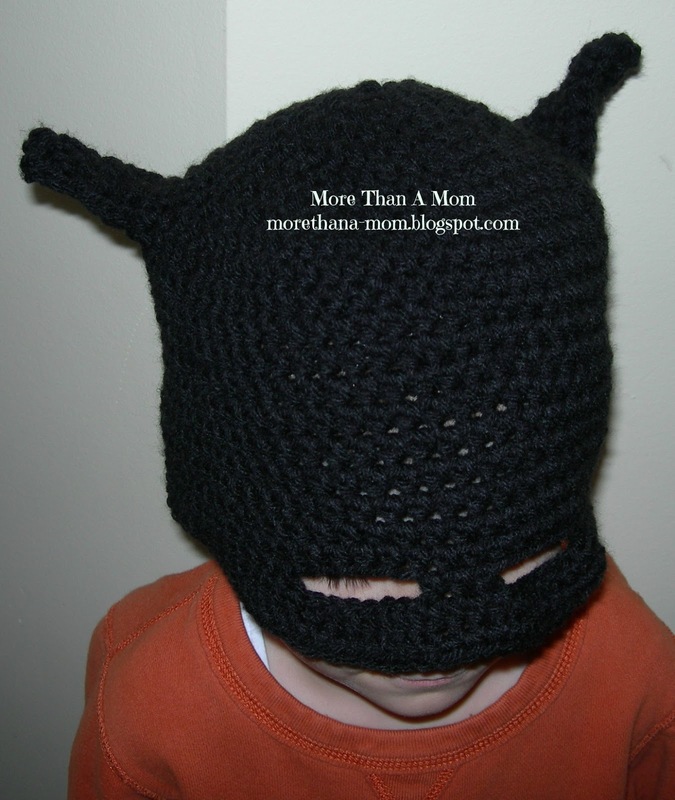 When he saw the Hello Kitty crochet hat I made my daugher, he quickly put in his order for a Batman hat. Plus a cape. The hat is ready to reveal. I'm proud of myself because I couldn't find the exact hat pattern I wanted so I made up my own. I have never written a pattern before so if you try it, please let me know if the directions need clarification. I think it looks pretty good if I do say so myself. He is just a little thrilled with it (in case you couldn't tell). This is a view from higher up so you can see the ears. Now to make the cape! This is the fun pattern I will be following. Fit ranges from a small child to teen or small adult. Rnd 9: Ch 2, hdc in first 17 sts. a) Front of Ear: hdc 6. ch 1, turn. b) sc2tog, 2 sc, s2tog (4 sc). Ch 1, turn. d) Sc2tog. (1 sc). Ch 1, turn. e) Back of Ear: Turn ear so that the ear’s point and base are horizontal (long side left to right). Sc in side of ear to base (6 sc). Ch 1, turn. f) Keeping ear on side, sc across to end. Ch 1, turn. g) Repeat row f twice. h) Making sure that you are starting at the tip and will end at the base, sc while joining into the front of the ear. Turn to crochet into the round of the hat. Hdc on base of hat 35 sts. Start Ear #2 following steps a-h.
Hdc on base of hat the remaining sts. Join. Rnd 18: Ch 2, 36 sts. Ch 8, skip 5 sts, hdc 3, ch 8, skip 5 sts, hdc to end. Join. Rnd 19-20: Ch 2, hdc in each st around, join.